As you can imagine, proper boot fit comes up in conversation at The Ski Renter quite a bit, so here are some key points. For boots, the watch words are “snug (like a glove), but not too tight”; you don’t want to cut off circulation, but you don’t want your foot loose in the boot, either. If the boots are too loose, or have too soft a flex in them, it will be more difficult to control the skis; and they won’t be as safe. A lot of people want to walk around in the boots to see if they are comfortable. Remember, ski and snowboard boots are not designed to walk in, they are designed to give you support and control while you are skiing or snowboarding. Ski boot and snowboard boot fitting are actually pretty similar. When you are standing straight or sitting, your longest toe may touch the front of the boot. However, when you flex your knees forward into your skiing or snowboarding position, this should pull your toes back so they are just barely touching or not quite touching the front of the boot. Too tight or too loose can cause discomfort or pain and will make it harder to control your skis. Your toes should just barely touch or not quite touch. Remember, snug, but not too tight means the boot fit is just right! Remember, wear socks designed for snow sports when you ski or ride. They will cushion your foot inside the boot, they will help keep your feet warm, and they will keep your feet drier than regular socks. And remember to wear the same or similar socks when you get your boots fitted that you will wear when you are on the slopes. Otherwise, they won’t fit the same. We have snow sports socks available at The Ski Renter for you to try on when you are being fitted for boots, and we sell snow sports socks, too! So now there’s no excuse. Up to a foot and a half of new snow, and now the forecast is cool and sunny for the next week or two. 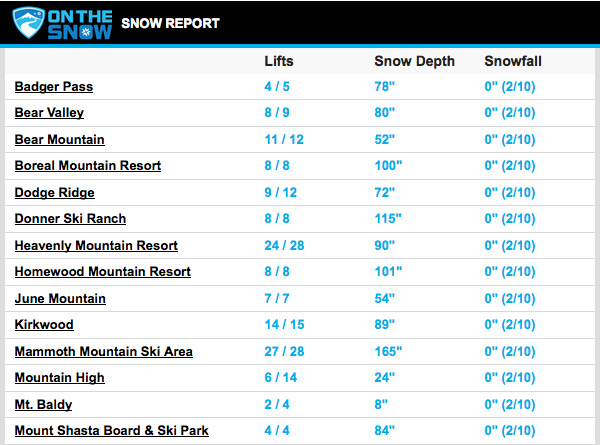 All of the resorts are reporting powder or packed powder. That’s almost perfect conditions for most of us, with ski hills reporting snow depths ranging from 75 inches to 140 inches! We are looking forward to a great President’s “Ski” Weekend coming up (February 13th, 14th and 15th). And for many, the entire week! So enjoy (and remember, “sunny” means use sunscreen)! On another note, we just got back from the annual ski show in Denver last week, where we previewed the equipment coming out later this year and placed our orders for next season. It was an awesome show, and great new equipment! We can hardly wait to get next year’s gear on our racks! It just keeps getting better and better! https://theskirenters.com/wp-content/uploads/2014/01/from-the-blog.jpg 333 800 The Ski Renters /wp-content/uploads/2011/04/the-ski-renter.png The Ski Renters2016-02-12 00:33:422016-03-01 00:40:20Awesome conditions!